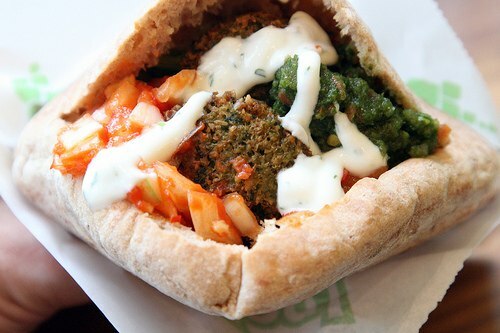 Okay, so one of my besties named Cindy had been trying to get me to try a Falafel for so long, I always declined. First off, I didn't even know what a Falafel was? Secondly why is it named Falafel? lol, so anyway, this year at work one of my coworkers ordered from Pita Express. They have a wide range of pita and Mediterranean dishes, she ordered a combination platter. The combo platter included 3 Falafel balls, Hummus, Thini, Greek Eggplant, Turkish salad, Israeli salad and is served with 1 pita bread. DELICIOUS! I was like wow, this is what I've been missing..lol I opened the Pita Bread, placed the balls in it, then put all the salads and hummus on top. The food was so light and very fresh. The combination of all the flavors was amazing, I can't wait to eat Falafels again as well as try other types of Mediterranean foods.